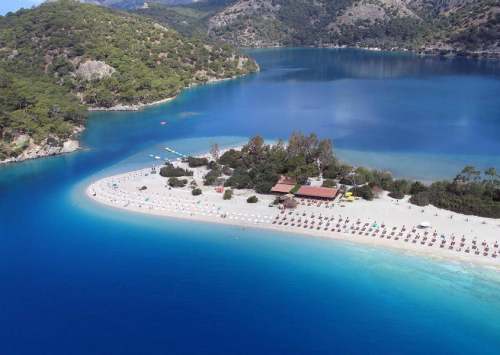 Super cheap vacation in Turkey: 7 days in hotel, flight, transfer for €110! UPDATE 3.5.: new dates (6.5.-13.5.) available for only €109 from Munich now (screenshot)! Discount travel now offers super cheap holiday packages in Turkey. 1 week of accommodation in Turkey, flight from Germany and transfer to/from hotel is now available for incredible price, just €110! This package includes 6 nights / 7 days in 3 star hotel Hanay Suite with beautiful swimming pool located in Side on Turkish riviera. Departures are possible from Bremen for €110 or from Leipzig for €156. You can also choose package with breakfast for €141 or with halfboard for €161 from Bremen. Travel dates are 4.5.-10.5. from Bremen and 18.5.-24.5. from Leipzig. « Last minute Tunisia with All Inclusive: 1 week for only €186!